Hi! My name is Sean Ingram and I'm the Senior Pastor at First Baptist Church in Stryker, Ohio. I'm headed for the second time to Ulaanbataar, the capitol city of Mongolia to help teach national pastors and church leaders. My first trip there was in February 2015. Once again I will be going as an auxiliary instructor with Tri-M missionary Doug Boisvert. The traditional approach to missions is for people who beleive that they have been called to raise support and move themselves and their families there. After they arrive they begin the process of learning the language and culture and then share the gospel and plant churches. There's nothing wrong with this approach - it has served the church well for about two centuries - but Tri-M goes about it a little differently. Instead they try to partner with national Christians - people who are already there, speak the language and understand the culture - and help provide what they don't have; namely, access to pastoral training and theological education. When the Soviet Union collapsed, it's hegemony over surrounding nations like Mongolia also collapsed. At that time, you could probably count the number of professing Christians in the country on one hand! Since then, about 60,000 now identify themselves as Christians, about 35,000 of those are Evangelicals. It's a tiny seed in proportion to the population, but we all know what Chirst taught about small seeds. (Mark 4:30-32) The church in Mongolia is, for all intents and purposes, still in it's first generation. They have no heritage of Christian thinkers, like we have in the West, who have puzzled through even the most basic doctrines and how it applies to their culture. There are no Christian schools or seminaries. There are no Christian authors, much less libraries or other resources. The pastors there are self-taught and often minister in remote areas with little support. They are just trying to figure it out as they go. Tri-M stands for Mobile, Modular, Ministry. We invest our resources into people - indigenous people - rather than organizations or buildings. We partner with national leaders to set-up one-week modules of three tracks: practical ministry, Bible exposition, and theology. We cover all the expenses including rental of a teaching facility, room, board, and materials. The attenders only responsibility is to get themselves to the location. A pastor or church leader who attends eight of these modules will get the equivalent of a seminary degree, plus will have begun building a library of resources in their own language. I am raising $3,500 for this trip. It will cover all of my travel expenses, plus my share (approx. 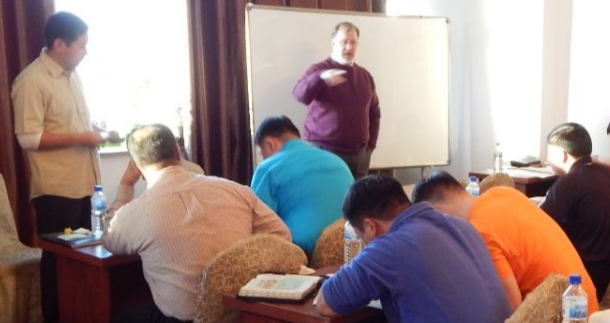 1/3) of the costs for us to provide this training to Mongolian pastors at no charge to them. About 25 of them will attend this module. I encourage you to pray about investing in the pastors and church leaders of Mongolia - your gift could literally bear fruit for generations to come! Thank you. Good luck, be safe! Lots of love!